﻿Here you get to know the authentic and original life of the Caboclos. 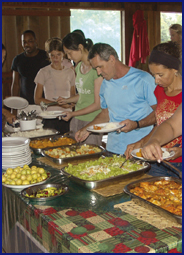 ﻿Enjoy the cordial hospitality and let yourself impress by the great commitment and knowledge of the guides. ﻿If you are ready to enjoy the original Amazonian life, you will have an unforgettable stay and an exciting experience. ﻿You will adapt well to the surroundings and have many opportunities to get to know the everyday life of the families on the farm. The stay is also very suitable for guests with children. Children are welcome here. In most cases they can easily get into contact with the local children of the farm. Children should be able to swim, the river being easily accessible. Don’t forget your swimming suit as swimming in the warm fresh waters is a very special experience. People looking for quiet will find it on the terrace with a view of the river or in a hammock. The g﻿﻿uest huts are placed on pales on the mainland and can be reached by wooden passages. The rooms are conveniently arranged. People knowing Brasilian accomodation appreciate that each of the huts has beds with high quality matrasses. A private shower and WC are also included. As a protection against the night active moscitos the windows are sealed with moscito meshing. The community room, which is both a meeting place and restaurant, is situated on a house boat on the river. From the house boat guests like to take the opportunity for a bath in the pleasantly warm water of the Mamori River.